Without question one of the most significant, albeit overlooked functions of the human system is the vital role of the sphenoid bone in neurological and hormonal health issues. This butterfly-shaped bone, which makes up the floor of the skull, articulates with literally all of the bones of the skull, making it a central pivot point of the entire cranium. It comprises the majority of the posterior wall of the optic compartment. Its anatomical structure is extremely complex and difficult to understand, forcing the famed physician Sir Oliver Wendell Holmes to utter at the opening of an anatomy lecture at Harvard Medical School, "Gentlemen, damn the sphenoid bone." If you have studied the anatomy of the sphenoid, you undoubtedly share this sentiment. The sphenoid bone's two most notable structures are the cup-like "sella turcica" (Turkish saddle) at the floor of the skull, which houses and protects the pituitary gland (master gland of the endocrine system); and the sphenobasilar articulation of the occipital bone. The sphenobasilar joint is where the sphenoid articulates with the occipital bone and because of its amphiarthroidial (partially movable synchondrosis) nature, establishes what many consider to be one of the most significant articulations of the body. This is due to the milking effect this joint has upon cerebrospinal fluid, in addition to its overall effect on the pituitary gland and the general nervous system. Because of the limited degree of flexibility within the sphenobasilar articulation, which it carries throughout life, this joint may and does become stagnated as a result of either major or minor head trauma to any surface of the skull, altered biomagnetic energetic effects of the Lower Shao Yang (Gallbladder) meridian, eye strain or muscle spasm along the occipital / cervico area to include any malocclusion of the teeth and TMJ involvement. Stagnated qi or energetic disruption in addition to fixation subluxation of the sphenobasilar joint may produce a variety of conditions that may persist if the vital areas affecting the sphenoid bone are not addressed. Most notably are dysfunctions of the endocrine system including the thyroid, adrenal, parathyroid, ovaries, testicles and all glands of the body. I have found that applying specific calibrated tuning forks to the sphenoid bone, creating an entrainment, results in deep relaxation of the facial muscles. Post the APOGEE Acu-Tone™ process, a refreshed, relaxed and newly energized facial expression comes forth. A facial vibrancy is noted by the recipient along with a deeply felt vitality and sense of well being. 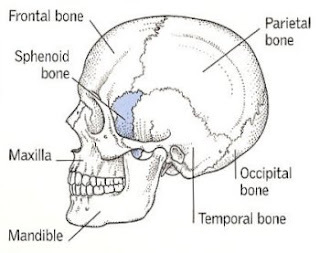 An irregular, wedge-shaped bone at the base of the skull (the Greek sphenoeides means "wedgelike"). 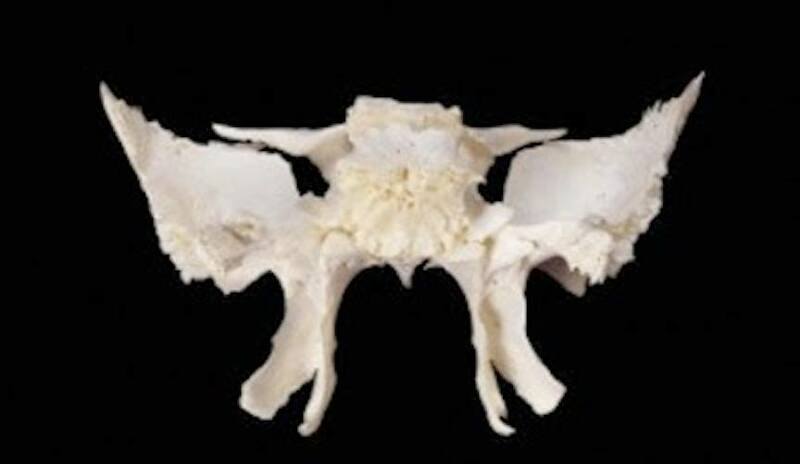 The sphenoid bone is notable in that it makes contact with all of the other cranial bones. It spans the skull laterally, helps form the base of the cranium, the sides of the skull, and the floors and sides of the orbits (eye sockets). The sphenoid bone is considered anatomically to have a central body, two greater wings, two lesser wings, and two pterygoid processes. The greater wings form part of the sides of the skull, and also extend inward to form part of the back surface of each eye socket. The two lesser wings form a small part of the back surfaces of the orbital cavities, and meet in the middle of the skull. Along the middle, a portion of the sphenoid bone rises up and forms a saddle-shaped mass called the sella turcica (Turk's saddle). The depression of this saddle is occupied by the pituitary gland. The sphenoid bone also contains the two sphenoidal sinuses, which lie side by side and are separated by a bony septum that projects downward into the nasal cavity, and channels for the optic nerve and other nerves. The look of vitality is indeed compelling. A face that reflects balance, relaxation, energy, radiance, and engagement, evokes interest and attention. To feel facial tension dissolve, tone improve, eyes brighten, along with a feeling of well being and renewal is what has been consistently reported to occur as a result of an APOGEE Acu-Tone™ experience. Calibrated tuning forks are applied to facial and cranium bones. The vibrations are received and communicated to the cells. An entrainment, sound transformation in an orchestrated crescendo, brings about the desired changes and the resulting renewal. Spontaneous responses, when looking in a mirror post the APOGEE Acu-Tone™ session, include such statements as: "My face feels so alive and relaxed." "I actually look younger." " My eyes look so awake and clear." "How can I keep this look?" "Such a great feeling." "Today, I visited Rose Marie Raccioppi for a Attunement Therapy Session ... the stress of losing Zinni has me very off balance in so many ways. Now, I am Blessed with balanced Chakra's and connected to the energy of the universe. She also did a Acu-Tone facial that worked like Botox to erase all the stress lines and open up my sinuses !! I feel renewed, refreshed and re-energized to continue my search for Zinni. Rose Marie you are a wise and gifted woman ... many many Blessings to you !! xxoo " (Patti Byman). • Figurative the ability to evoke or suggest images, memories, and emotions. • Physics the reinforcement or prolongation of sound by reflection from a surface or by the synchronous vibration of a neighboring object. • Mechanics the condition in which an object or system is subjected to an oscillating force having a frequency close to its own natural frequency. • Physics the condition in which an electric circuit or device produces the largest possible response to an applied oscillating signal, esp. when its inductive and its capacitative reactances are balanced. • Physics a short-lived subatomic particle that is an excited state of a more stable particle. • Astronomy the occurrence of a simple ratio between the periods of revolution of two bodies about a single primary. • Chemistry the state attributed to certain molecules of having a structure that cannot adequately be represented by a single structural formula but is a composite of two or more structures of higher energy. ORIGIN late Middle English : from Old French, from Latin resonantia ‘echo,’ from resonare ‘resound’. ORIGIN early 17th cent. (in the sense [moving rapidly, vibrating] ): from Latin vibrant- ‘shaking to and fro,’ from the verb vibrare. That makes it a central pivot point of the entire cranium. It comprises the majority of the posterior wall of the optic compartment. Because of the limited degree of flexibility within the sphenobasilar articulation which it carries throughout life, this joint may and does become stagnated as a result of either major or minor head trauma to any surface of the skull, altered bio-magnetic energetic effects of the Lower Shao Yang(Gallbladder) meridian, eye strain or muscle spasm along the occipital/cervico area to include any mal occlusion of the teeth and TMJ involvement. These points are to be used bilaterally on Tai Yangas both Yin Tang and GV 16 are midline points. 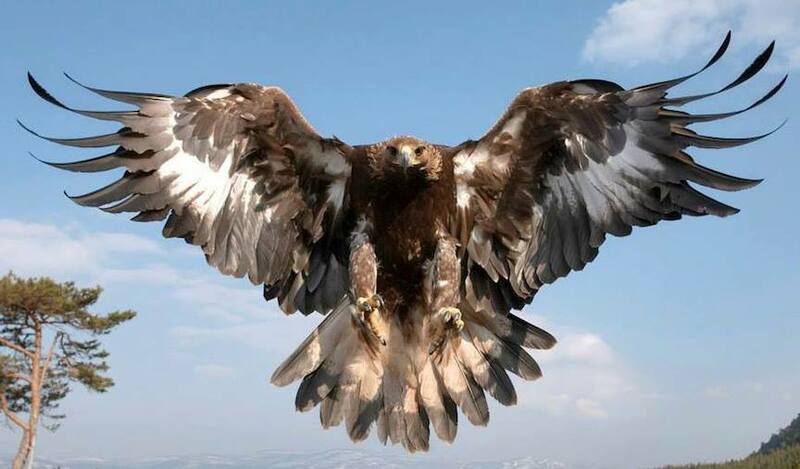 This received this very morning in response to a Facial Vibrancy Acu-Tone™ Session given last evening... yes delight it is... " Thank you, thank you. I woke up to a glowing fresh face, that looked better than it did the day before. Celebration I shall partake today thru the weekend.